Before the Commodore 64, the IBM PC, and even the Apple I, most computers took input data from a type of non-magnetic storage medium that is rarely used today: the punched card. These pieces of cardstock held programs, data, and pretty much everything used to run computers in the before-time. But with all of that paper floating around, how did a programmer or user keep up with everything? Enter the punch card sorter and [Ken Shirriff[‘s eloquent explanation of how these machines operate. Card sorters work by reading information on the punched card and shuffling the cards into a series of stacks. As [Ken] explains, the cards can be run through the machine multiple times if they need to be sorted into more groups than the machine can manage during one run, using a radix sort algorithm. The card reader that [Ken] examines in detail uses vacuum tubes and relays to handle the logical operation to handle memory and logic operations. This particular specimen is more than half a century old, rather robust, and a perfect piece for the Computer History Museum in Mountain View. It’s always interesting to go back and examine (mostly) obsolete technology. There are often some things that get lost in the shuffle (so to speak). Even today, punched cards live on in the automation world, where it’s still an efficient way of programming various robots and other equipment. Another place that it lives on is in voting machines in jurisdictions where physical votes must be cast. Hanging chads, anyone? Punch card data input is so 1890 US Census, right? Maybe not, if your goal is to educate kids about binary numbers and how they can encode characters. In which case, this paper clip and metal tape punch card reader might be just the thing you need. Built as part of the educational outreach efforts of the MakeICT hackerspace, this project allows kids and adults to play with binary numbers and get some instant feedback. The reader itself is a simple affair of wood and plastic; bent paperclips make contact with a foil tape strip and LEDs show the state of the five input bits. A card is provided to students with spaces for the letters of a word that they want to input, along with a table to translate each letter into a number. Students use a paper punch to encode each character in binary. As the card is pulled through the reader, the letters are spoken by the Pi in turn and the whole word is pronounced at the end. We’ll no doubt hear quibbles with the decision not to use ASCII for the character set, but we can see the logic in keeping the number of bits to a minimum and not distracting from the learning process. What’s cool about this is that it engages kids on so many levels. They learn about binary numbers, encoding systems, interfacing a computer to the real world, and if they care to delve deeper, they can learn about the code behind everything. It’s a great hook into the hacking arts. And once the kids learn a thing or two, maybe they can use this punch-card Twitter interface to tweet their new-found knowledge. Sometimes you just have parts lying around and want to make something out of them. [Tymkrs] had a robot paper cutter, so naturally they made punch cards. But then, of course, they needed a punch card reader, so they made one of those too. All with stuff lying around the shop. The Silhouette Portrait paper cutter is meant for scrapbooking, but what evokes memories of the past more than punchcards? To cut out their data, rather than cute kittens or flowers, they wrote some custom code to turn ASCII characters into rows of dots. And the cards are done — you just have to clean up the holes that didn’t completely cut. These are infamously known as hanging chads. The reader is made up of a block of wood, with a gap for the cards and perpendicular holes drilled for LEDs and photoresistors. This is cabled to a Propeller dev board with some simple firmware. We would have used photodiodes or phototransistors, because that’s what’s in our junk box (and because they have faster reaction time), but when you’ve got lemons, make lemonade. OK, now that you’ve got a punch card reader and writer, what do you do with it? Password storage comes to mind. In case you haven’t heard, we’re giving away a trip to space. We have $50,000 to promote giving away a trip to space too, and this week we’re giving away some OSH Park gift cards. If you have a project that’s held together with hot glue on a 40-year-old piece of perf board, add a project log describing how you need some free PCBs. A few months ago, some guy in Texas found the original molds for the Commodore 64C, the Plus/4 and the 128. That discovery turned into one of the best examples of what Kickstarter can do. Now, new keycaps are being manufactured with an Indiegogo campaign. If you’re waiting on your C64c case to be pressed out of a mold, this is not the time to think about the sunk cost fallacy. They’re not Cherry MX compatible, but they will work with just about every version of the C64. Not bad for under €20. The UK has a fabulously rich history of ancient melee weapons, ranging from the flail to the mace and a bunch of odd bladed weapons used by the Scots. This tradition was passed down to the UK mains plug, the single most painful plug to step on. Apple just released a USB charger with a folding UK mains plug and [oliver] did a teardown on it. For St. George’s Day in Catalonia, there’s a tradition of giving roses to women, and books to men. [Nixieguy] has all the books he could want, and would prefer to receive a rose. Bucking tradition, he made himself a rose from a punch card. It’s the closest he’s going to get to ‘@}-\—’. 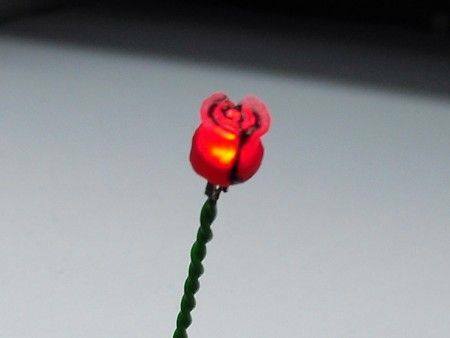 A few years ago, he carved a rose out of a 10mm LED. Finally, a decent tutorial on how to grow your own SMD components. Need to take apart a cellphone? Use acetone! Need the phone to work after you take it apart? Ummmm…. The Dayton Hamvention is just three weeks away! Yes, the same weekend as the Bay Area Maker’s Faire, which means most of the Hackaday crew will be elsewhere, but I hear [Chris Gammell] will be there putting Parts.io stickers on everything. By the way, I’m looking for a Tek PM203 Personality Module for a 68000 64-pin PDIP. Punch cards were a standard form of program and data storage for decades, but you’d never know it by looking around today. Card punches and even readers are becoming rare and expensive. Sometimes it takes a bit of hacking [YouTube link] to get that old iron running again! [Antiquekid3] managed to score an old punch card reader on Ebay, but didn’t have a way to interface with it. The reader turned out to be a Documation M-1000-L. After a bit of searching, [Antiquekid3] managed to find the manual [PDF link] on BitSavers. It turns out that the Documation reader used a discrete output for each row of data. One would think the Documation reader would be a perfect fit for the PDP-8 lurking in the background of [Antiquekid3’s] video, but unfortunately the ‘8 lacks the necessary OMNIBUS card to interface with a reader. Undaunted, [Antiquekid3] threw some modern hardware into the mix, and used an Arduino Uno as a Documation to Serial interface. The Arduino had plenty of I/O to wire up with the card reader’s interface. It also had a serial interface which made outputting data a snap. The ATmega328 even had enough power to translate each card from one of IBM’s many keypunch formats to serial. [Antiquekid3’s] test deck of cards turned out to be a floating point data set. Plotting the data with a spreadsheet results in a nice linear set of data points. Of course, no one knows what the data is supposed to mean! Want more punch card goodness? Check out this tweeting punch card reader, or this Arduino based reader which uses LEGO and a digital camera to coax the data from the paper. It all started with a conversation about the early days of computing. The next thing he knew, [Tim Jagenberg’s] colleague gave him a stack of punch cards and a challenge. [Tim] attempted to read them with a mechanical contact and failed. Undeterred, he decided to make a punch card-to-keyboard interface using optical parts from disassembled HP print stations. Specifically, he took apart the slotted optical interrupter switches to use their IR-LEDs and photo-transistors. Next, [Tim] drilled holes into two pieces of plastic, gluing the LEDs on one piece of plastic and the photo-transistors on the other. The photo-transistors tell the Teensy 3.1 whenever a hole is detected. [Tim] developed an interpreter on the Teensy that reads the punch card according to IBM model 029 keypunch codes. The Teensy enumerates as a USB keyboard when connected to a computer. As a punch card is read, the Teensy outputs the decoded characters as key presses. When a punch card has been completely read, an ‘Enter’ key press is transmitted. Tweeting the punch cards is no more complicated than typing the text yourself. Naturally, the first message posted on Twitter from the stack of punch cards was “Hello World!” [Tim’s] binary and source code is available for download on Github. We’ve enjoyed covering the backstory of the punch card and a previous project reading these cards using a digital camera setup. It’s always interesting to see the clever ways people use current technology and can-do attitude to read data from obsolete systems that would otherwise be lost. We wonder what is on the rest of those punch cards? Let’s hope [Tim] has more punch card tweets soon!